Driving home with a friend the other day, we were talking about all the expectations placed on homeschool families. My friend, who is in the beginning stages of homeschooling, stated that she felt as though she had to prove something. This thought is normal. Often the world will look into our home and our choice of education and place lofty standards on us and our children. Sometimes, due to the “pride of life” (1 John 2:16), we raise the expectations ourselves. But if we could just lay the world’s standards and our own pride aside, we would find such freedom. Homeschooling should be simple. It should be a lifestyle that creates in our children a love for God and learning along with a mindset of always pursuing knowledge. I have never wanted school to take place from 8 to 3 on Monday through Friday. I don’t want their education to just be from Kindergarten to 12th grade. I want my children learning every day of their life. Following the world’s standards will often lead to filling their minds with useless information. I don’t want to fill their minds; I want to shape their hearts and point them to God. I want to create in my children a desire to learn all they can for God’s glory. I want them to excel in reading good literature, to chase after truth in science, to discover the world through God’s eyes (HisStory), and I want them to use their writing and communication skills to change the world. The concept of lifestyle teaching for God’s glory is certainly simple. It’s just hard at times. But isn’t all of parenting? A parent’s role in teaching their children is crucial. This is true whether or not we are homeschooling. So, with all the teaching we do, there is one imperative lesson that needs to be taught. This one lesson needs to be given first and foremost. It is found in Ephesians 6:1-3. This commandment is the foundation upon which successful teaching is built. Ephesians 6 gives two commands for children. They are to obey and honor. Obedience is an action. Honour is an attitude. It is to our children’s detriment if we fail to teach them this fundamental lesson. A child who does not learn to consistently obey their parents will struggle in life. It will not go well with them (Ephesians 6:3). They will also struggle in their academic studies if obedience is a problem. But even more important than that, if we fail to teach our children to honor and obey us, they will not learn how to honor and obey God. A lack of proper respect and obedience for those in authority will transcend into a lack of proper respect and obedience for the Highest Authority – God Almighty. But society in general rebels against authority, doesn’t it? But like it or not, authority is a large part of life. We are always under some type of authority. Children must learn to submit to the authority of their parents. Christian wives must learn to submit to the authority of their own husbands. Husbands must learn to submit to the authority in the workplace. We all should submit to church and governmental authority. All believers must submit to God’s authority. Even unbelievers will one day submit. “For it is written, As I live, saith the Lord, every knee shall bow to me, and every tongue shall confess to God,” Romans 14:11. (Sadly, by the time an unbeliever learns to submit to God’s absolute authority it will be too late for them.) Submission to authority is a reality of life. And it is one that has been under attack since the beginning of time. Today we see unnecessary heartache because of the lack of understanding biblical authority. There are miserable parents who have failed to teach this truth to their children and who are reaping the consequences. “The rod and reproof give wisdom: but a child left to himself bringeth his mother to shame,” Proverbs 29:15. There are husbands and wives who are struggling in their marriage because they have never been taught proper authority or have simply chosen to ignore it. “Therefore as the church is subject unto Christ, so let the wives be to their own husbands in every thing. Husbands, love your wives, even as Christ also loved the church, and gave himself for it,” Ephesians 5:24-25. There are churches that are spiritually dying due to sin in the camp and a refusal to lovingly establish the authority of church discipline. “Your glorying is not good. Know ye not that a little leaven leaveneth the whole lump? Purge out therefore the old leaven, that ye may be a new lump, as ye are unleavened,” 1 Corinthians 5:6-7a. Untold numbers of boys and girls live in daily turmoil at home and with society because no one taught them the truth of authority. Thousands of men and women are in prison today because they did not submit to proper authority. Do you see the importance of authority? The first four commandments given to Moses in Exodus 20 were between man and God, the next six between man and mankind. “Honour thy father and mother” was the first commandment that relates to our relationship with others. It was also the first commandment with promise – “thou mayest live long on the earth.” God saw this commandment as important. Don’t let your children disobey or dishonor you. It fabricates a weakness in their life that will be hard to overcome. 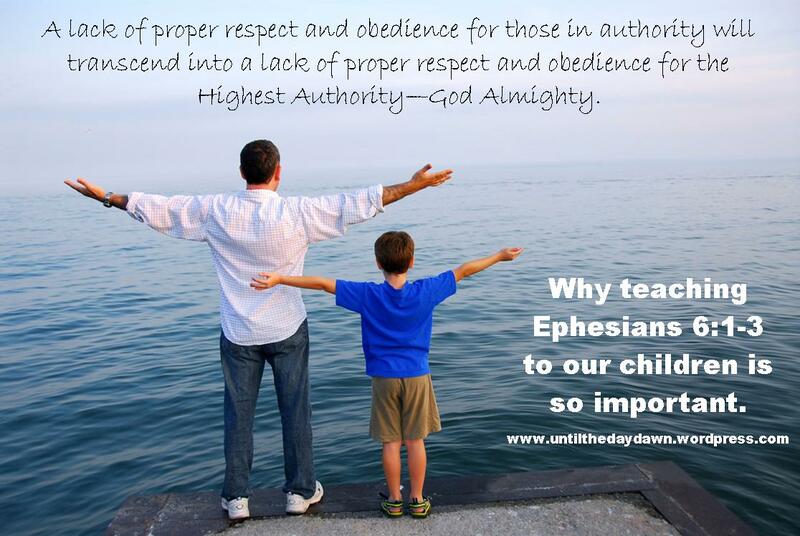 Love them enough to teach them the importance of authority, honor, and obedience. In doing so, you will be pointing them to the Highest Authority – God Almighty. Hey Girl, You Better Guard Your Heart!